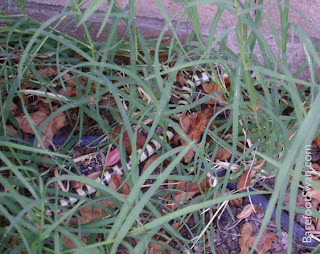 Last week we found a cute little Shovel-nosed Snake living in our backyard. He had paused at the edge of the planter where I was weeding, like he was trying to figure out what had disturbed his neighborhood. I immediately stopped weeding to let him pass safely - and to grab the camera. 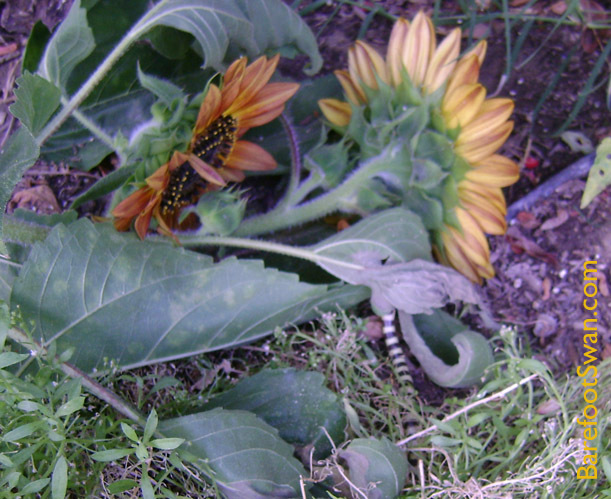 He quickly crawled under the plants and leaf litter as he moved through the planter. Every now and then I could see him between the leaves and snapped a quick picture. He moved very purposely toward the wall at the back of the planter, pausing to smell with his tongue, then proceeding cautiously. When he reached the open area he moved quickly along the wall. He approached a small hole in the ground, paused briefly at the edge to taste again, then quickly disappeared down into the hole. Shovel-nosed Snakes are smooth and shiny, with beautiful dark bands on a creamy white or pale yellow background. 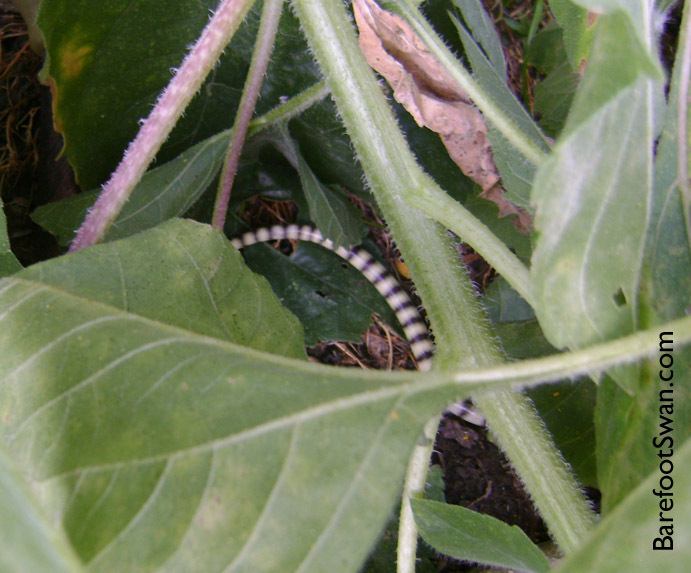 They are small, only reaching 16-17 inches in length and about as big around as a pencil. The jaw is underset, which helps it to burrow or "swim" under the sand where it usually rests during the heat of day. At night it emerges to feed on insects, centipedes, scorpions and moths. They are great guests to have in your garden. This is a desert snake, found in appropriate habitats from southern Nevada to northeast Baja California, and west into central Arizona. They prefer areas with loose sandy soil they can burrow in, and sparse vegetation like mesquite and creosote. Annular Eclipse trip - Day Three (Sun 20 May) ECLIPSE DAY! 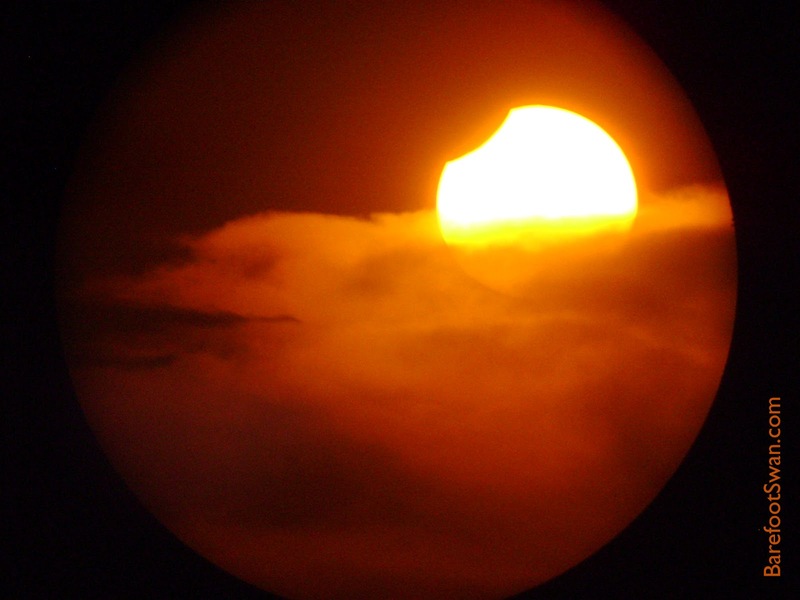 Solar eclipses occur when the sun, moon and earth line up precisely, so that when the moon passes between the earth and the sun, it blocks the sun's disk. In a total eclipse, the moon covers the sun completely, and the moon's shadow falls on the surface of the earth. The sun's corona and prominences are visible. During an annular eclipse, the moon is further from earth, and is too small to cover the sun completely. No shadow falls on the earth's surface, and the sun appears as a dramatic glowing ring in the sky. ** Even with over 90% of the sun's disk covered, it is still too bright to view directly. 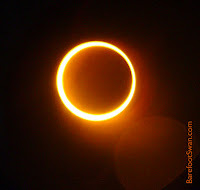 Filters and proper eye protection must be used during ALL phases of an annular eclipse. We've been chasing eclipses since viewing our first total solar eclipse in 1991, in the Sea of Cortez. We have seen 5 total eclipses and 3 annulars (counting this one). In addition to Mexico, eclipse chasing has taken us to the Caribbean, Pacific Northwest, Southern California coast, Zambia, Egypt and China. 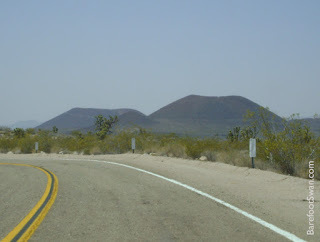 So a road trip to Tonopah was relatively easy compared to some of our previous eclipse viewing ventures. 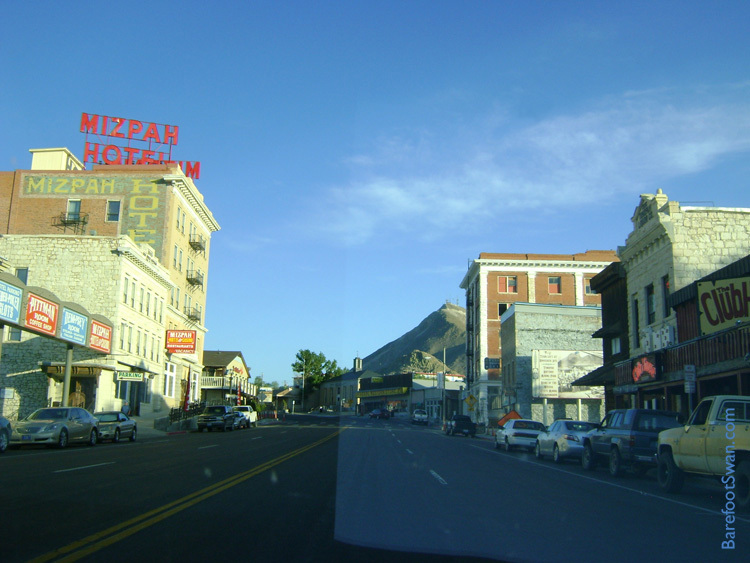 Tonopah is located about halfway between Las Vegas and Reno in west-central Nevada, at an altitude of just over 6000 feet. 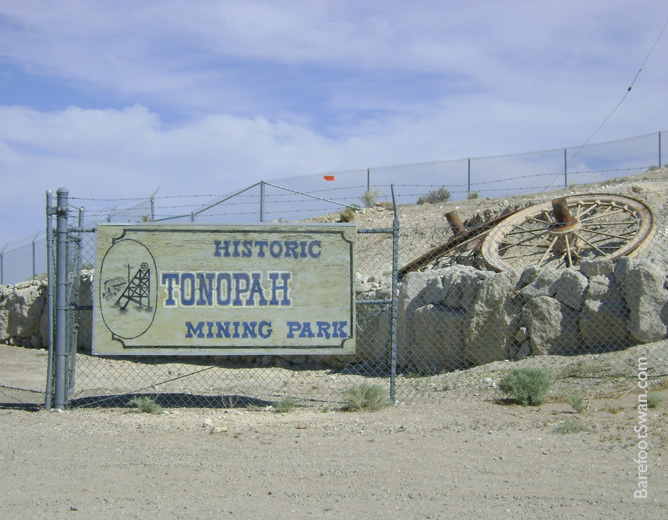 Tonopah began life as a mining town around 1900, with the discovery of gold and silver. Today Tonopah still has a small town feel with many historical buildings still standing. 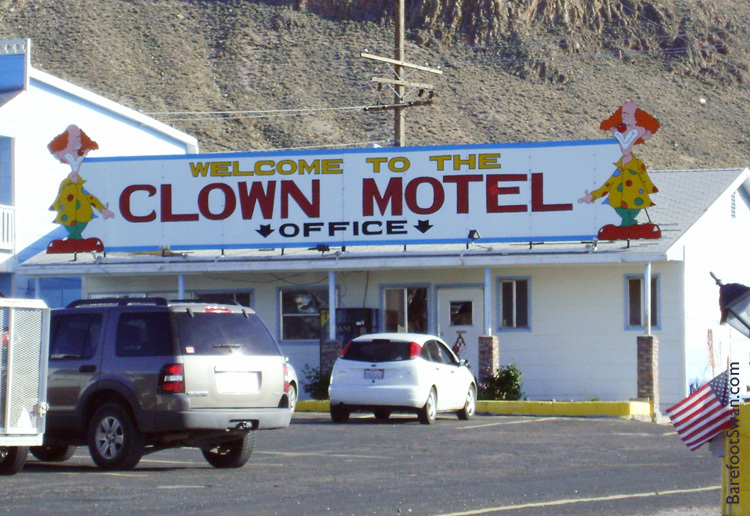 The town is also home to the Clown Motel which - oddly enough - is located next to a cemetery. 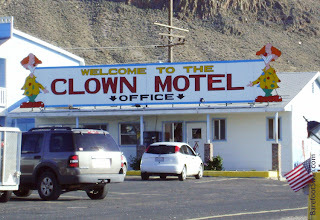 If that combination doesn't creep you out (and if you aren't coulrophobic) the motel advertises some pretty cheap rates. A flyer from the local astronomy club (Tonopah Astronomical Society) said there would be a public eclipse viewing at the Tonopah Mining Park, which was about a block away from our hotel. Since we were already able to view annularity from Tonopah, we decided to join the event with our scopes. There are miles and miles of abandoned mining tunnels below the Park and the entire town. 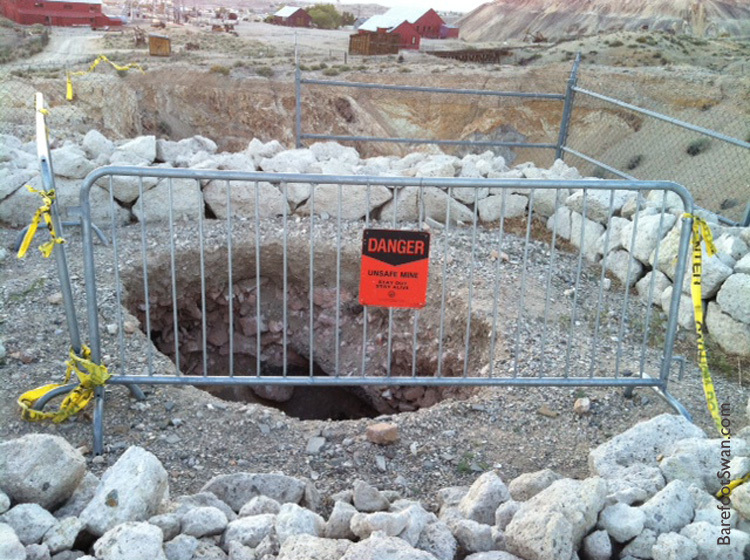 Sometimes sink holes appear unexpectedly, like this one in a corner of the Mining Park's parking lot. The larger "glory hole" behind it had actually swallowed up an entire building many years ago, when the mine was still in operation. There were a lot of nice scopes and set-ups for the eclipse. Many people were local, but others (like us) had travelled from out of the area. One gentleman had come all the way from Maine! 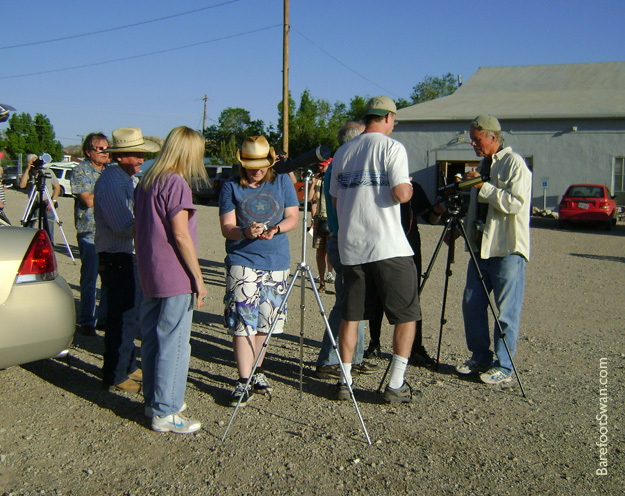 The Tonopah astronomy club had safe solar viewing glasses and filters available for sale, and they sold out quickly. Our regular field scope, which we normally use for birding, was fitted with a Baader filter for safe solar viewing. And a good friend also loaned us his Coronado PST, which gave views of the solar surface and prominences. 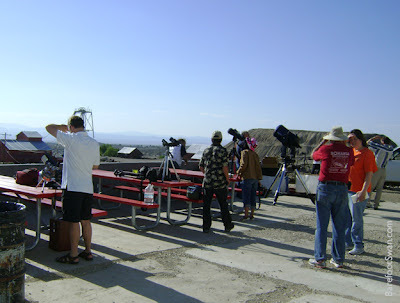 People were simply holding their digital cameras or phones up to the telescope eyepieces to take eclipse pictures, and getting really good results. We also encouraged eyeball viewing through the safely filtered scopes. The entire eclipse lasted just over 2 hours, with first contact at 5:18pm. At our location we had about 3-1/2 minutes of annularity as the moon passed centered in front of the sun. The last bite of the moon slid past at 7:38pm, as the sun set in a low bank of clouds on the western horizon. These are my 2 favorite pics: one during annularity, and the other at sunset. We left Parhrump, Nevada early Saturday morning and took SR-190 to enter Death Valley from the east side of the Park. Again, traffic was very light and the vistas were beautiful. At over 3 million acres, Death Valley is the largest national park in the contiguous United States. Over millions of years the land has been covered in turn by inland seas and intermittent Ice Age lakes. 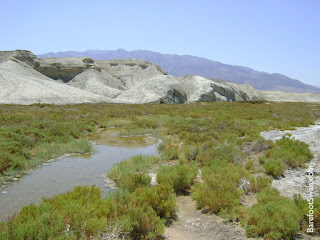 The lake bottoms filled with layers of gravel, mud, minerals and salts eroded from the surrounding mountains. 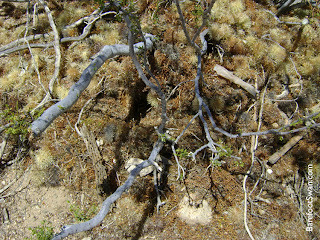 Seismic activity further tilted and shaped the landscape. 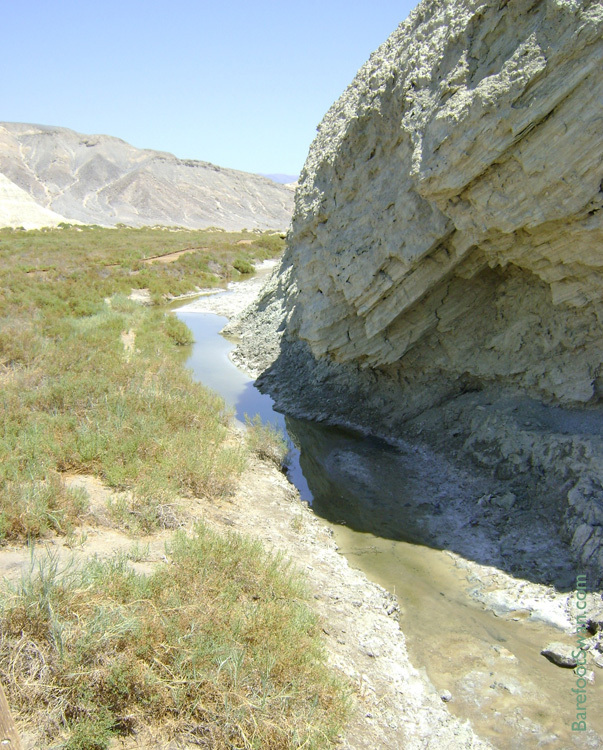 When the waters finally evaporated they left behind mineral riches including silver, gold, copper, salt deposits and borax. Death Valley's dramatic geologic history is readily evident in its mountain ranges, salt flats, sand dunes, alluvial fans, valley floor, and volcanic craters. 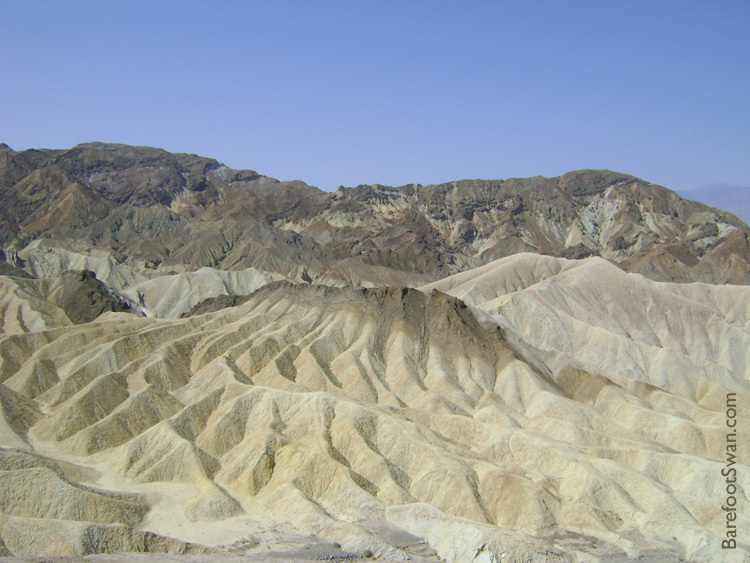 In 1933 a portion of Death Valley was designated as a National Monument. 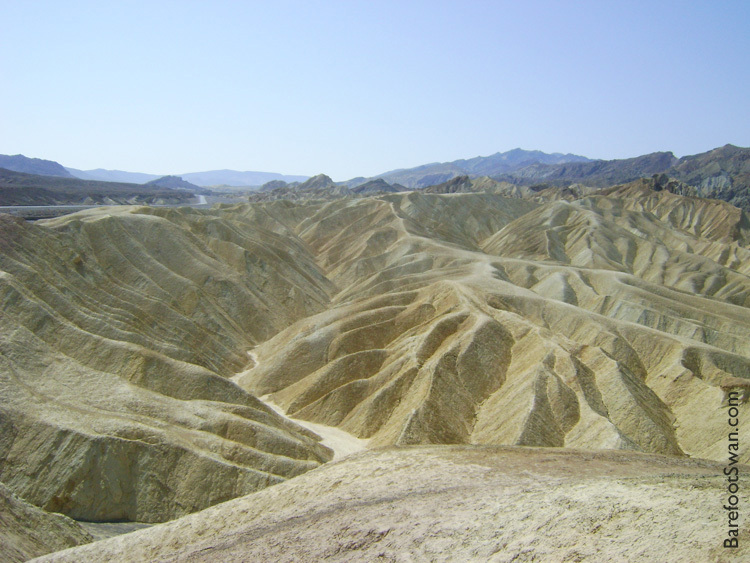 The Desert Protection Act of 1994 added over a million more square acres and Death Valley became a National Park. We got out at Zabriskie Point to stretch our legs. A short walk from the parking lot up to the overlook gives panoramic views of the Furnace Creek Badlands. 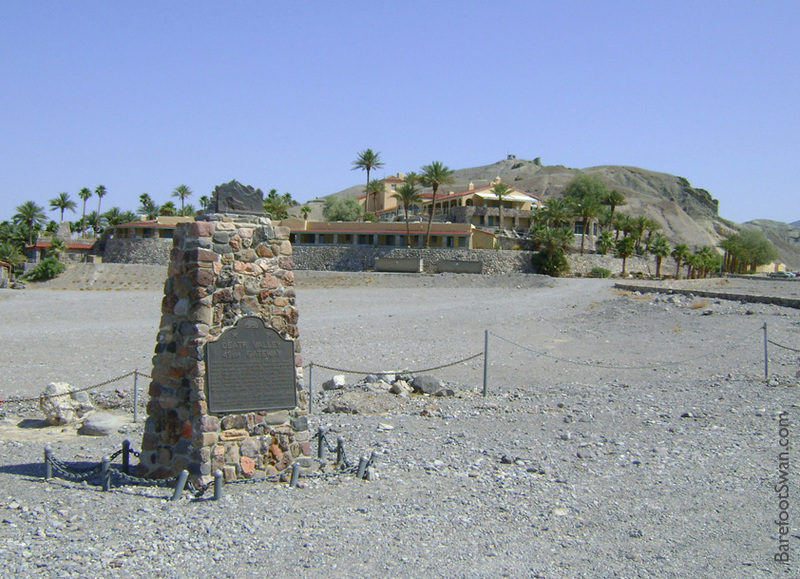 A monument near the Furnace Creek Inn, honors the 49'ers who came through Death Valley on their way to the California Gold fields. South of Furnace Creek Inn, Badwater Road leads to Artist Drive. This one-way 9 mile paved road winds past colorful hillsides and canyons. 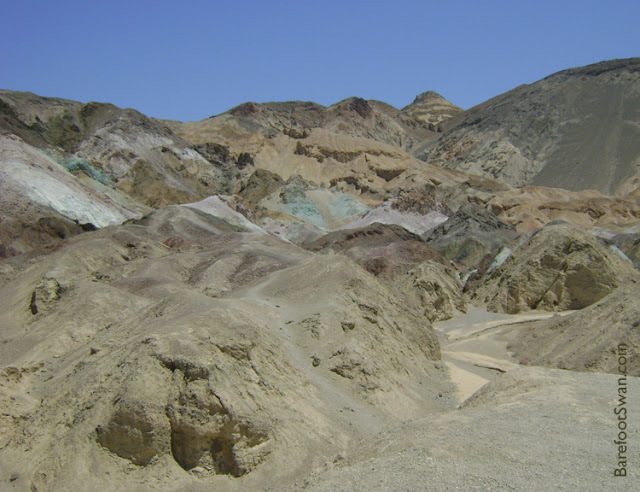 An area called Artists Palette is particularly colorful with unusually colored rocks in shades of turquoise, red, lavender, white, green, black, orange, yellow, grey and brown. It was a scenic spot for a lunch break. Our next stop was Salt Creek, located off the main highway at the end of a 1-1/4 mile graded dirt road. 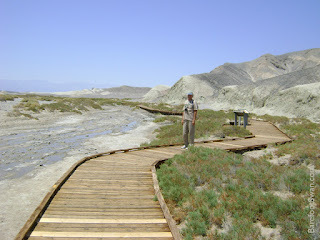 A raised boardwalk nature trail follows the path of the creek and helps protect the fragile area from human impact. Salt Creek is home to a small population of Desert Pupfish, tough little survivors from a time when a freshwater lake (Lake Manley) covered the area up until about 2000 years ago. As the lake dried up, the fish became isolated in pockets of water that varied in salinity and temperature. Eventually the isolated populations evolved into 10 distinctive species, each adapted to their unique environment. 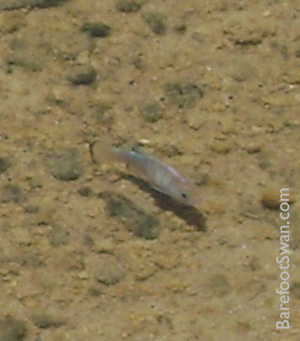 DESERT PUPFISH - Cyprinodon sp. Two of these pupfish species are now extinct, four are endangered and one is threatened. Water availability is crucial to the continued survival of these tiny, rare and extraordinary creatures. Ubehebe Crater is located about 40 miles north of Salt Creek, on the North end of Scotty's Castle Road. 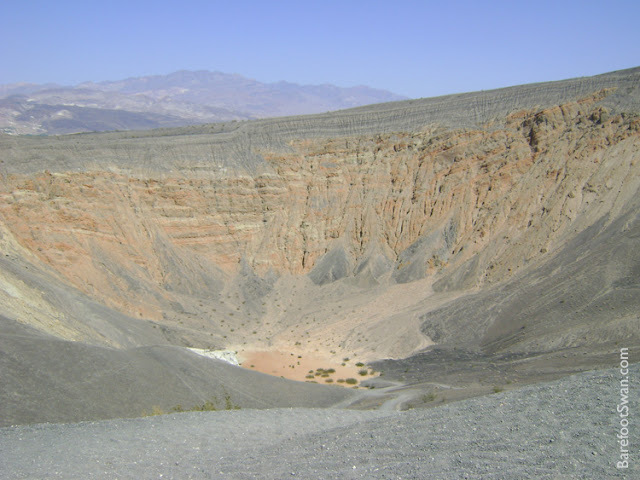 It is a volcanic explosion crater, formed a mere 2000 years ago. 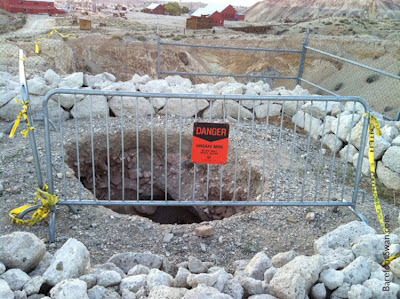 Hot magma turned groundwater into steam, and the resulting explosion created a crater 1/2 mile wide and 500 feet deep. 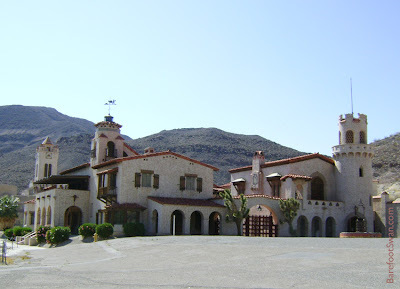 Scotty's Castle was our last stop in Death Valley. This Spanish-Moorish style mansion was built by a Chicago millionaire in the 1920's, as a winter home. 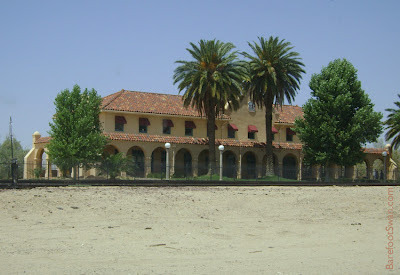 There is no charge to walk the grounds; tickets can be purchased for ranger-led tours of the buildings. Time was short so we did some birding as we enjoyed the stroll. Our bird list included Western Tanager, Yellow-rumped Warbler, Bullock's Oriole, Yellow Warbler and Common Raven. 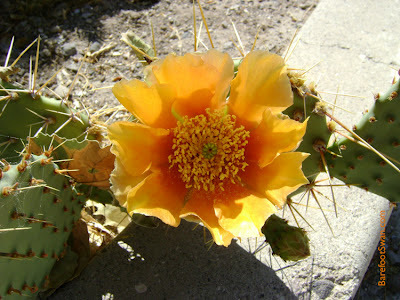 This cactus was blooming in one of the planters near the Visitor Center. 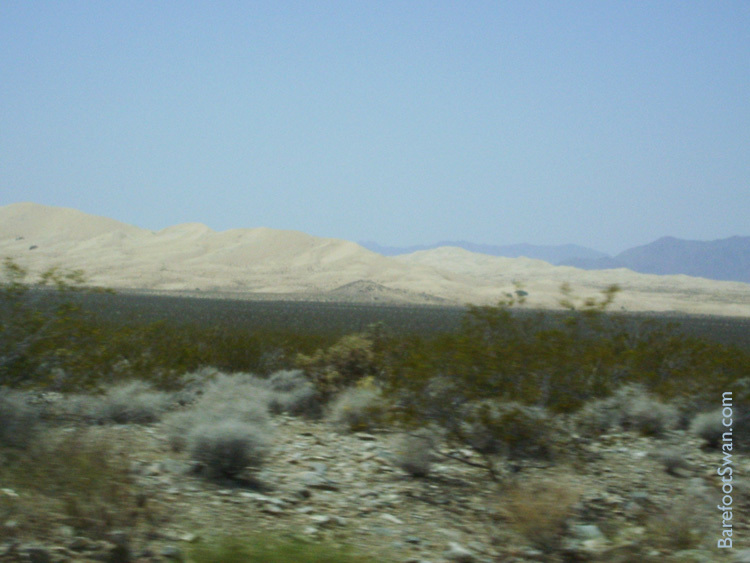 We left Death Valley and continued driving north to Tonopah, Nevada - our viewing site for the annular eclipse the next evening. The annular eclipse on Sunday, May 20th was only going to be partial in our area, so we decided to drive to Tonopah, Nevada to be able to view the full ring effect. We chose Tonopah because of its altitude and excellent chance of clear skies on eclipse day. We took the scenic route heading north, going out through Joshua Tree National Park. 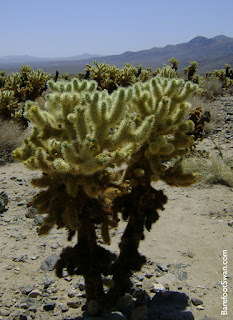 The chollas in the Cholla garden had already bloomed, but they were still beautiful backlit by the morning sun. A pack rat had built its nest right next to the nature trail. 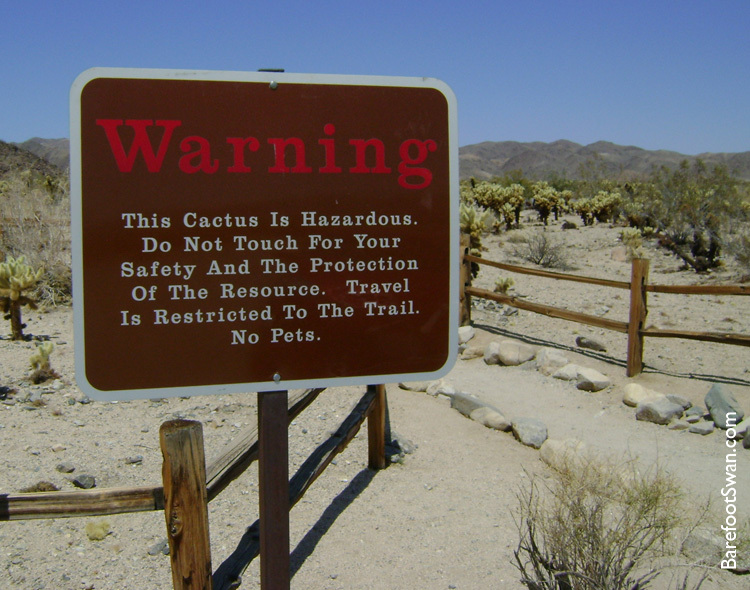 The spiny cactus joints protect the pack rat from potential predators when it is in its burrow. Fortunately for the pack rats, they don't know how to read. 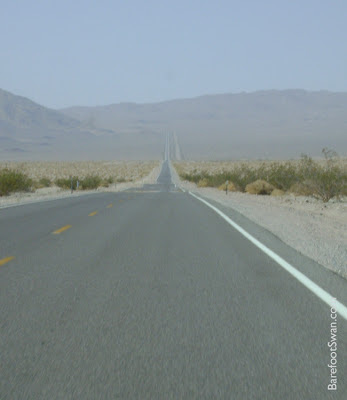 North of Joshua Tree, the roads were nearly devoid of traffic. 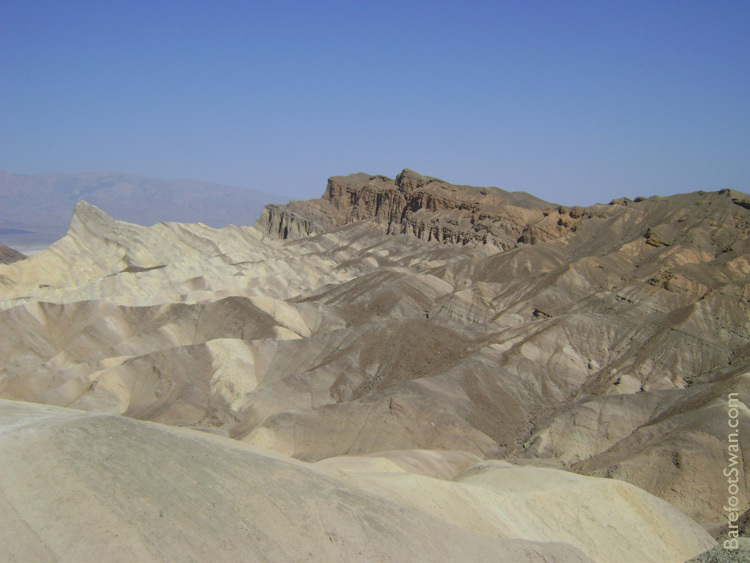 There were beautiful, open vistas and interesting geological features along the way. We passed Kelso Dunes and Kelso Depot on our way to Pahrump, Nevada. 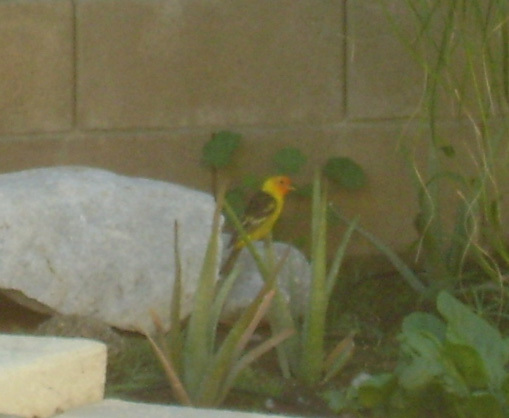 We had a new bird visitor to our yard yesterday morning - a handsome male Western Tanager. This is the first time we've seen this species in our yard, so it's a new one for our Yard List. Mr. Western Tanager is eye-catching and colorful in breeding plumage. He is bright yellow with a red head and black tail. The wings are black with two wing bars. Females are a dull yellow with greyish-green back and darker wings. Western Tanagers are migrants here in the desert. They winter from Baja and Central Mexico to Costa Rica, then head north in spring for their nesting grounds in coniferous forests of western North America. Western Tanagers eat insects, fruit and nectar. We'll be putting out some extra oranges and bananas at the feeders to help him on his journey north. These pics were taken from a distance of about 30 feet away, and through the sliding glass door. 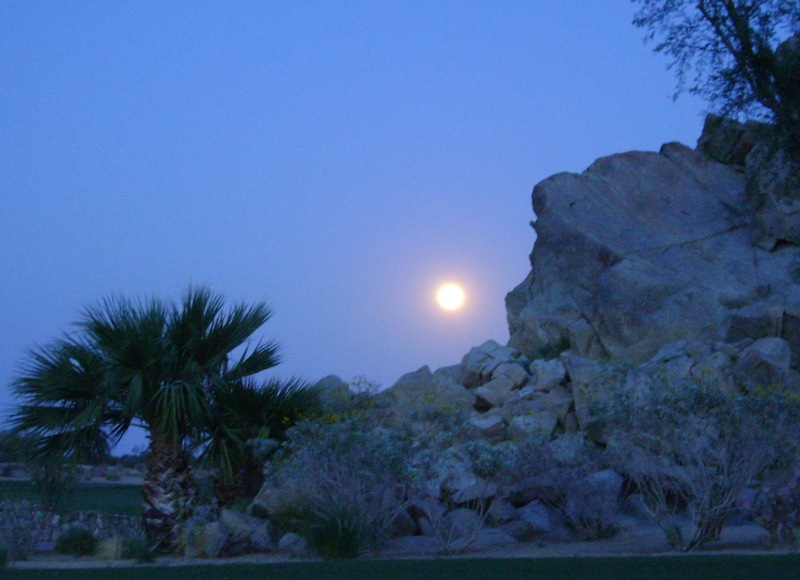 The full moon on Saturday, May 5th, was the largest and brightest of 2012: a "Super Moon". The moon was full at the the same time that its elliptical orbit brought it closest to earth ("perigee"). 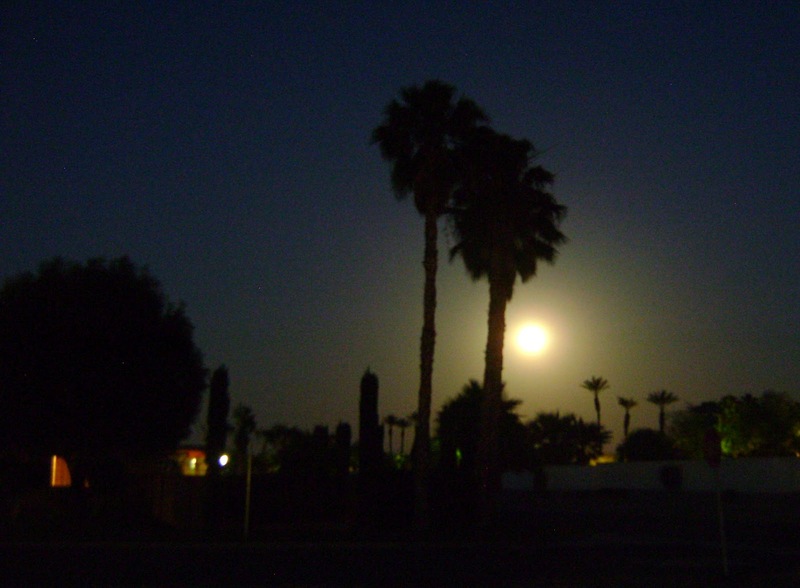 During a "Super Moon", the moon can appear to be 30% brighter and 14% larger than it does when it is farthest away from earth ("apogee"). Here are some favorite shots, using just the point and shoot camera on a tripod. It is baby bird season, and there are lots of them in our yard. A young Mourning Dove was hesitant to fly when I approached to refill one of the bird feeders. It eventually made a short flight up into the Sweet Acacia tree, and watched me from above. 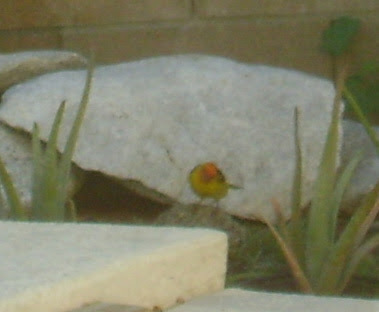 Verdin parents are bringing their young to feed on the sliced oranges we put out for them. They love the nectar in the hummingbird feeders too. House Finch dads are getting chased and pestered incessantly by their hungry offspring. The young flutter and gape nearby, begging to be fed. They are flying well enough to follow their beleaguered parent no matter where he goes. A pair of Bewick's Wrens has been vocal and active in our fruit trees. This morning one of the adults had a big juicy insect in its bill, and waited for me to go back inside before disappearing into the foliage with the yummy morsel. I heard a young mockingbird's dry whistle coming from its nest hidden in our mesquite trees. It called excitedly when the parent returned with food, then was silent after being fed. 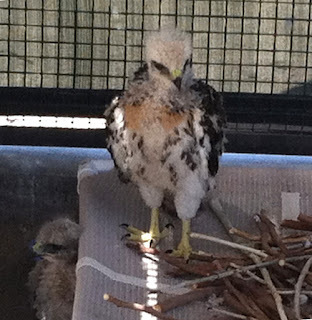 The volunteers at the Coachella Valley Wild Bird Center in Indio are coping with the regular influx of "found" baby birds this time of year. 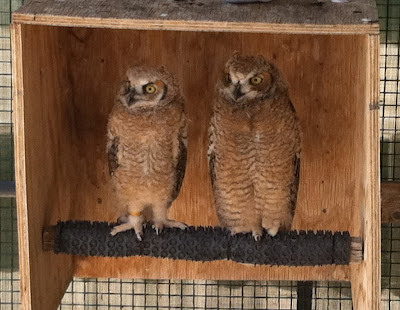 Their main specialty is working with birds of prey, but many other bird species are under their temporary care now. 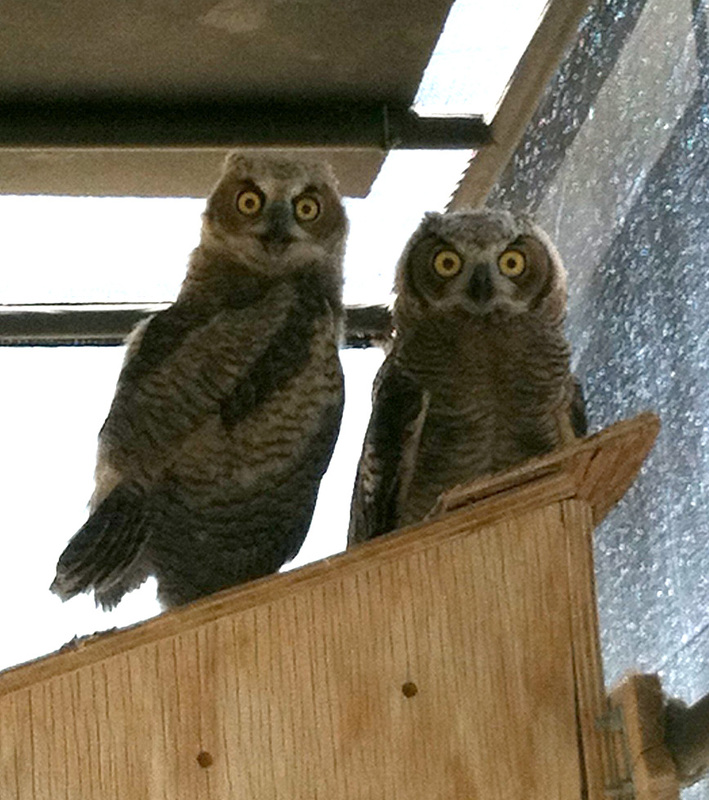 Many of the non-releasable resident birds at the WBC serve as foster parents to the young of their same species. This reduces human contact and keeps the young birds as wild as possible. As soon as the young can fly and hunt on their own, they will be released back in the same area in which they were originally found, so they can return to their life in the wild. Here are some of the current residents. 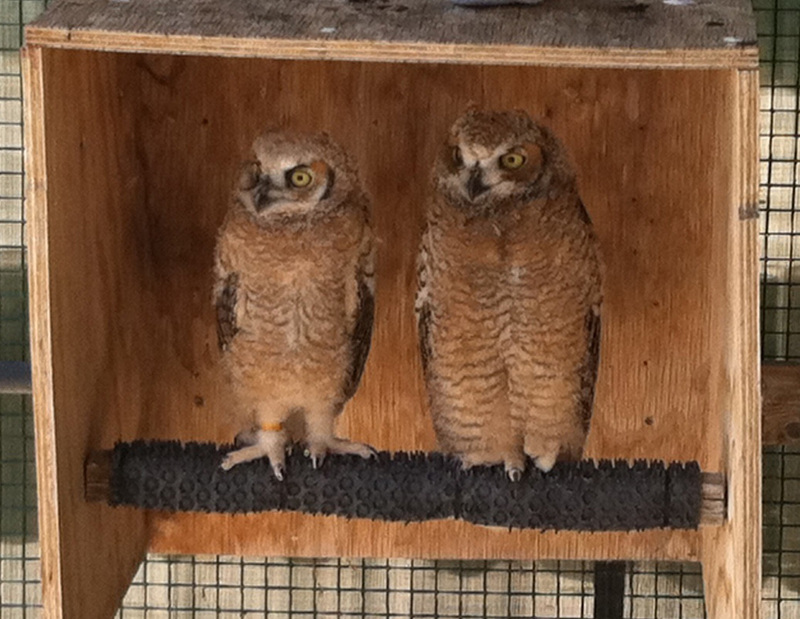 These young Great Horned Owls already have huge feet with respectable talons. Roja, a female Red-tailed Hawk, is a permanent resident. 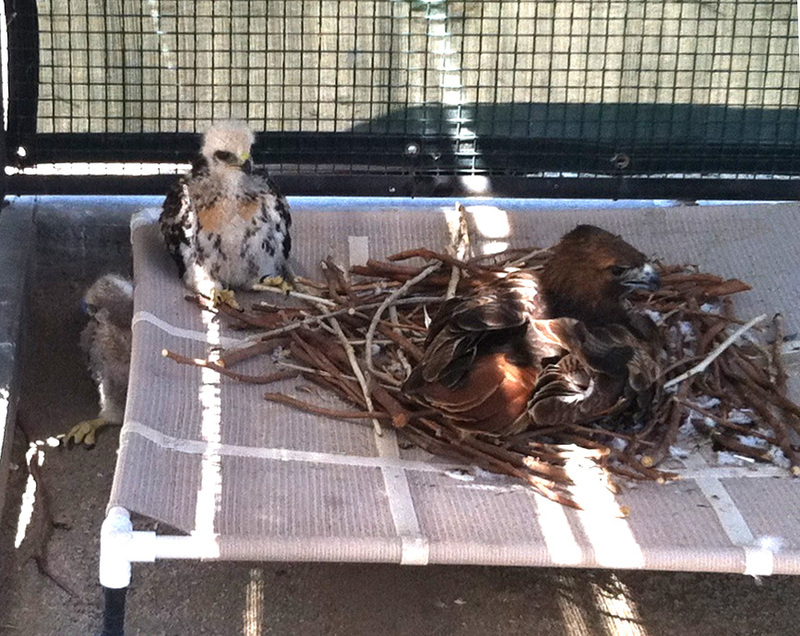 She is foster mom to two young Red-tails that were brought to the Wild Bird Center. 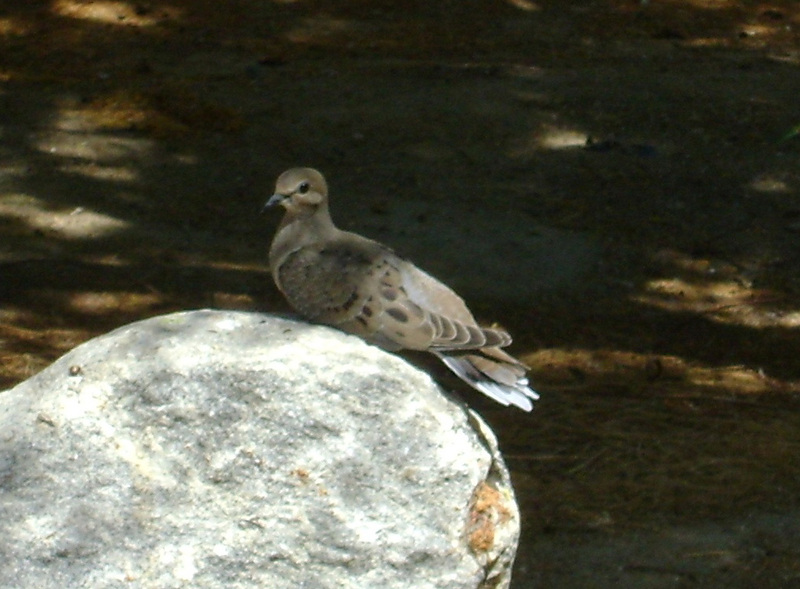 Many times people find a young bird on the ground and assume it has been abandoned by its parents. This is rarely the case. Most likely, the young bird is learning to fly and its parents are nearby, watching closely (and waiting for the big scary humans to leave). California Department of Fish and Game regulations state that "rescued" wild birds may only be held briefly by the public before either being released back to the wild, or brought to a licensed wildlife rehabilitation facility such as the Wild Bird Center. If you do find a bird on the ground, observe for a time before making a decision whether or not to intervene. -- If the bird has very few feathers and its eyes are closed, it probably just fell out of its nest. Locate the nest and quietly replace the bird. It is NOT true that parent birds will reject babies that have been handled by humans. Harassment, lingering and disturbing the nest area are what cause problems. -- A young fully-feathered bird that is hopping but not flying, has just left the nest. It will take a few hours - or days - for it to learn how to fly gracefully. The parents know where it is, and will bring it food during this time. 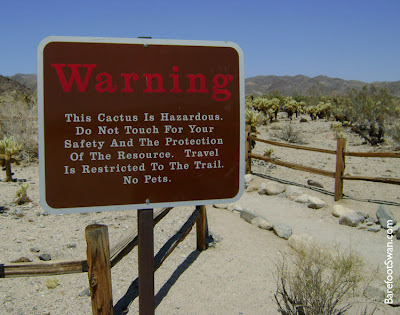 Remove any pets or people who may present a danger to the fledgling. 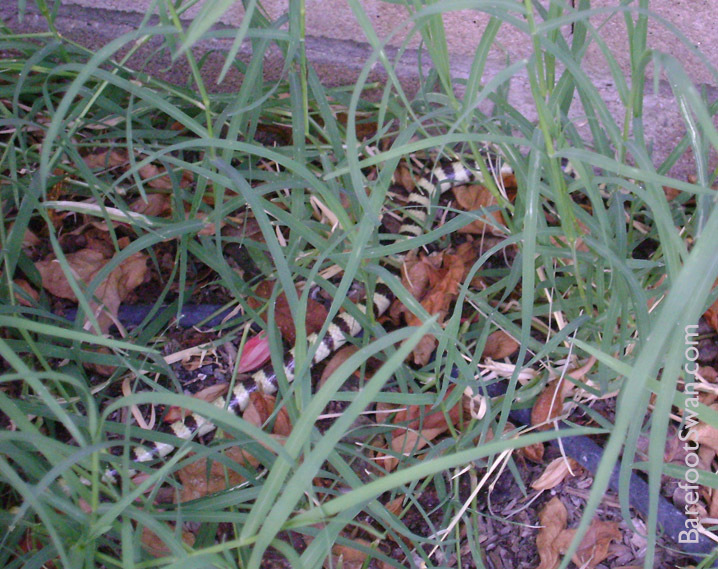 If it appears to be in immediate danger, gently move it to a sheltered spot such as under a bush or up in a tree. Let the parent birds do their job of raising their babies. -- Keep human contact to an absolute minimum. -- Do not feed human food of any kind. -- Do not put wild birds in wire cages; the wire will damage feathers. Use a box instead. -- Wild birds are easily stressed, so keep them as quiet as possible. -- Contact your local Fish and Game Office or Animal Control to find a licensed wildlife rehabilitator in your area. 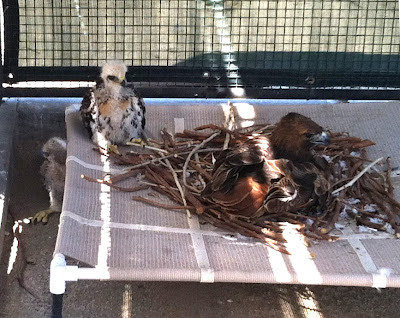 -- If you do bring in an injured bird, consider making a donation to help these facilities pay for the food, veterinary bills, and other overhead that they incur while caring for these babies. Or better yet, become a volunteer :-). The peach and nectarine trees are loaded with ripening fruit, and the branches are bending under the weight. We did not thin the blossoms this year, so we'll be getting more fruit of smaller size. 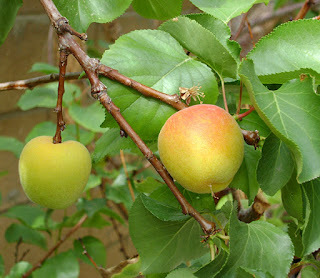 The nectarines are still a bit hard, but should be ready in another week or two. They are a beautiful rosy red color. 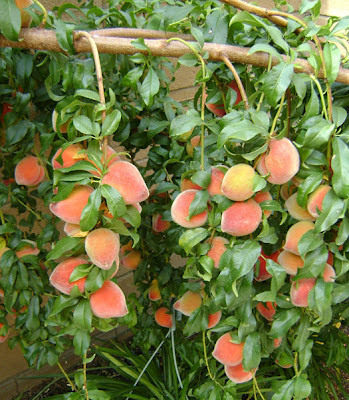 Some of the peaches are ripe now. 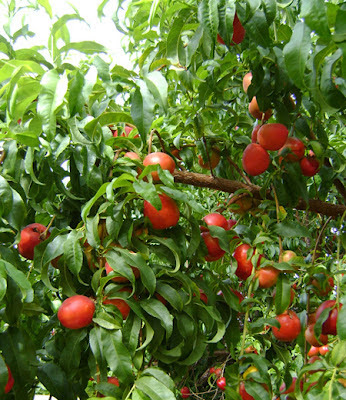 We've already picked and enjoyed them right off the tree, and baked in a fresh peach pie. The birds aren't quite as picky, and they have already been helping themselves. The House Finches are the main culprits. Time to start the "passive " bird deterrents. The apricots are still mostly green, with a few of them starting to change color. 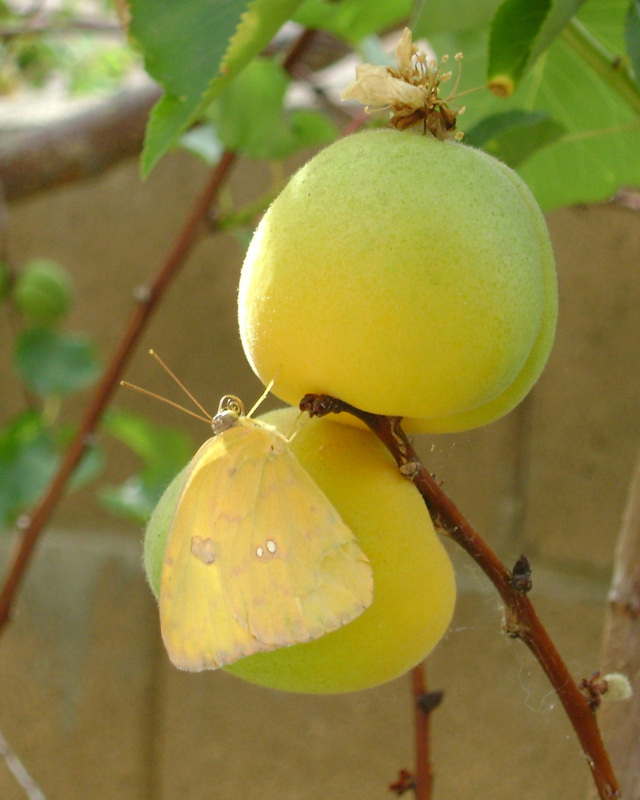 This butterfly's colors blended perfectly with the yellow-green fruit it was perched on.